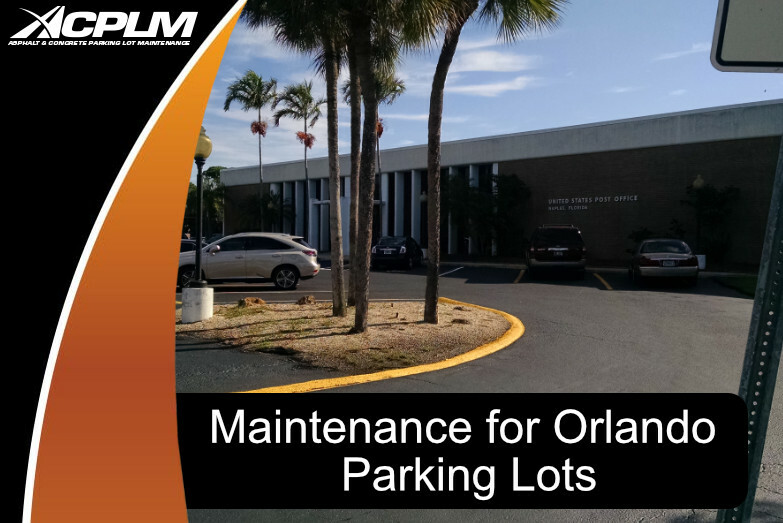 ACPLM’s parking lot maintenance services will keep your Orlando parking lot in optimal condition year-round. The condition, visual appeal, and safety of your Orlando parking lot matter a great deal. This is the first portion of your business that visitors experience. If it has been a while since your parking lot has had maintenance or repairs, it is time to take action. Our parking lot professionals can analyze the condition of your Orlando parking lot, pinpoint trouble spots, perform repairs, and extend this space’s useful life. Sealcoating serves the purpose of protecting the surface of your parking lot. This is a protective shield against damage from gasoline, oil, salt, and oxidation. Furthermore, asphalt sealing delays the need for repairs stemming from weatherization. This is an important means of guarding against water that seeps through cracks and leads to the formation of cracks, potholes, and other problems. Asphalt parking lots in Orlando should be sealed about six months to a year after installation and every two years after. Signs of cracking should be tended to right away. Your asphalt’s cracks are unsightly and a potential sign of trouble down below the surface. Let us seal your asphalt cracks to stop moisture from degrading the structural base below. Sealcoating will suffice for cracks smaller than ¼ inch in width. Cracks larger than this width will necessitate the application of a crack sealer. Potholes form when water moves below the surface of the pavement by way of a crack. The soil is moistened and subjected to wear and tear to the point that it softens and forms a depression. Asphalt gradually unravels and breaks apart into sub-particles like gravel and stones. You will not be able to tell when your asphalt requires replacement. Gauging the useful remaining life of asphalt pavement is a job best left to the professionals. Our team will assess your Orlando parking lot’s integrity and determine if it has deteriorated to the point that it needs replacement or if repairs will suffice. If you own or manage a business in Orlando, contact us to learn more about our Orlando parking lot maintenance services. Give us a call at 888-959-9637 to coordinate an initial consultation and learn more about our services.